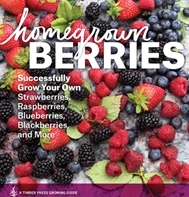 Whether it's the superior flavor, nutritional value, or visual appeal that you appreciate most about fresh fruit, it is easier now than ever to grow your own — and to enjoy a broader season of harvestable fruit as well. Fruit production can seem like unfamiliar territory for growers new to it, though. It involves systems that are a little different from those of vegetables, for planting, cultivation, harvesting, and post-harvest handling. To make it easier to get started, we offer a carefully curated selection of seeds, bare-root plants, and organic plugs that reliably produce high-quality fruit. We've chosen complementary varieties that bear from late spring, across summer, and right into the fall seasonal slots. By way of encouragement, here are five of the best reasons to plant some of these varieties yourself this year — so you can enjoy all the benefits it brings to the table. For many, the superior flavor of fresh fruit is reason enough to grow their own. For those who grow for a living, the eating quality of their produce speaks for itself: Locovores prize the flavor of produce that skips the long truck ride and reaches the table at peak eating quality. Farmers' market customers flock to vendors with locally grown fruit for sale. CSA members develop stronger ties to farms that supply a wider range of fresh produce. Chefs can highlight the farm-to-table link by listing the provenance of their fruit on dessert menus. 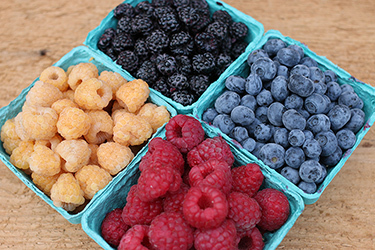 And back at home, even the most finicky eaters will snack on tender, naturally sweet ripe berries. 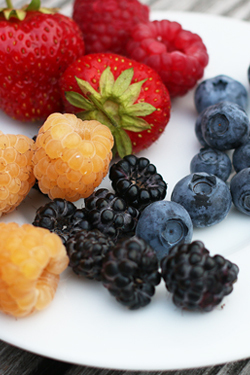 Fruit consumption is on the rise, thanks in part to findings on its powerful health benefits. Many of the phytochemicals that lend fruit its attractive coloration, aroma, and flavor are also phyto nutrientsthat shore up the immune system, counteract free radicals, support strong bones, and aid in the prevention of cancer, cardiovascular disease, and age-associated cognitive decline. People can feel great about eating fruit! Johnny's fruit varieties have been selected to fill a sequence of harvest slots, and we offer a number of widely adaptable berry cultivars. Many berry plants need time to reach full fruit-bearing productivity, and the 1–3-year wait for those varieties is certainly worthwhile. Meanwhile, however, you can plant some of the newer fruit varieties that bear earlier to fill in the gaps. 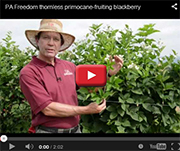 'Prime Ark Freedom' Blackberry, a cultivar that bears fruit on thornless, first-year canes, is an excellent example. To learn more, watch this video from University of Arkansas cane fruit breeder and professor of horticulture, John R. Clark, PhD. 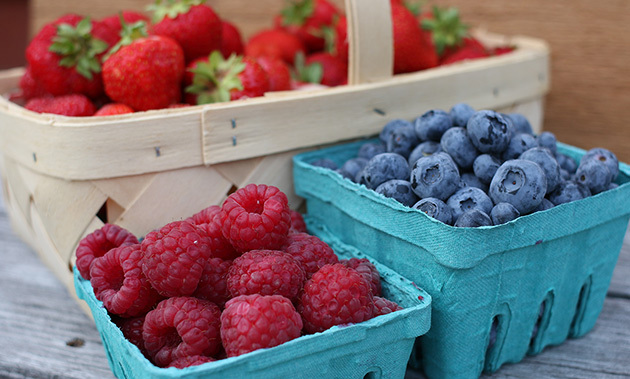 And for more details on season extension, refer to our Blueberry, Raspberry, and Strawberry Harvest Programs. Whether you're in the business of growing or not, growing your own fruit is sound economics. Home gardeners money by growing their own fruit, enjoying it fresh during the season and putting it by for year-round savings. Commercial growers can charge a premium for fresh, ripe fruit, which not only adds visual attraction to farmstand offerings but provides the key ingredient for value-added products (such as blueberry jam) that can be sold or consumed at any time of year. Strawberry plants can be grown from seed for pack sales. 'Seascape', 'Gasana', and 'Tarpan' strawberry plants are great for hanging baskets, container sales, and gifts. And our certified-organic strawberry plugs can save you growing time, utilize space most efficiently, and jumpstart the greenhouse season. And because we offer plants in small quantities, growers can trial a range of commercial varieties without a big upfront expenditure. Start with a collection designed to fill each seasonal slot. For season-long harvesting, plant one or more of our collections, or use our Fruit Harvest Charts to select a complement of fruit cultivars to fill each slot. We select our fruit varieties on the basis of outstanding flavor, appearance, and yield across the widest possible harvest window. When you're looking to decide which varieties will best suit your needs, be sure to take note of the harvest times offered by each variety. If you're new to growing fruit, our Easy Choice Fruit Plant Collections offer a convenient way to get started. We offer a Blueberry Collection, a Red Raspberry Collection, and a Strawberry Collection, each of which includes early, mid, and late-season varieties to help you maximize your harvest. For more information on selecting a complement of varieties to fill your harvest slots, see our Fruit Harvest Programs.